KaiXinz's: Bonus Points Worldwide Now!! Omg I'm so excited! 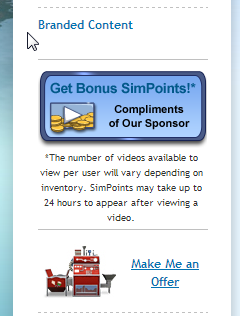 I logged into the Sims 3 website and visited the store and I realised that they give out bonus points to non-Americans! In the past, they had this thing where the members just have to view an advertisement and they will be able to get 50simpoints (or something like that, I'm not too sure. I'm not an American hahaha). When I heard about it I was so excited until I realised that you have to be from America to be able to see it. Sighs. Then I logged in today after a long long time and I realised that they have opened it up worldwide! Now, it doesn't matter which country you're from - as long as you can access the internet haha, you can get the free bonus points! It's basically a blue button that says, "Bonus Simpoints" - you will know when you've seen in. And all you have to do is click it, watch the video (make sure the video has ENDED) before exiting the tiny window. Some videos end with a freezing screen so it makes you think that the video has ended. Some of the ads are only worth 5 simpoints, some 10 simpoints. Just view as many as you can. I think there's a limit to how many ads you can view in one day, that's why when you log out you'll see the banner but once you've logged in, you don't see it anymore. So just wait for 24 hrs or so and you should be able to get the bonus simpoints again. Save up your simpoints, people! Ok, bye!